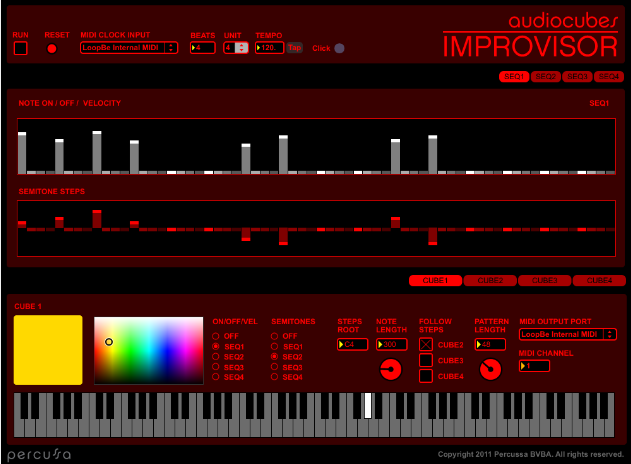 Percussa has announced on their blog that they are working on a new app called Improvisor. The idea of IMPROVISOR is that each cube is linked with a groove and a relative note pattern, which is played back in a loop. You can add and remove loops by adding and removing cubes. By placing the cubes next to each other, their note patterns are added to each other, creating completely new melodies, all in key and in rhythm. These can be sent via MIDI to your favourite software or hardware synth. you can let the cubes each play back their sequences of semitone steps, and you can add them to each other when the cubes are placed next to each other, creating completely new melodies. This is called “following”. To use IMPROVISOR you just have to have one cube connected to your computer. The other cubes are autodetected as they are added. You can set cubes to have a specific colour using the colour picker. As an AudioCube user, I appreciate that Percussa continues to explore unique ways to add value through apps that take advantage of the unique features provided by the AudioCubes.